Your computer and our GVLT Give Big Events! Giving BIG is easy. All you have to do is visit our GVLT Give Big profile to make an online donation. You can choose to support multiple organizations at once. Easy! Throughout the day, the Bozeman Area Community Foundation (BACF) will be giving away thousands of dollars in prizes to participating nonprofits when donors give. Check out the prize schedule at www.givebiggv.org to learn about prizes. This year’s goal is raise $1,500,000 for Gallatin Valley nonprofits in 24 hours! 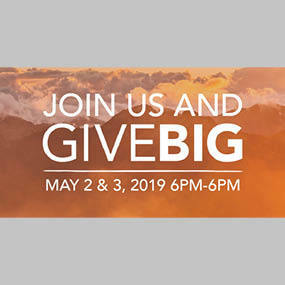 Stop by our Donor Lounge at REI at 6pm on May 2nd or the base of Peets Hill on Friday, May 3, 2019, from 11:00 am to 1:00 pm. Plus, make your Give Big donation to GVLT of $50.00 or more at our Donor Lounges, and we’ll give you one of our new GVLT Tote Bags. Love your Valley, and make a fashion statement, all in one stop!